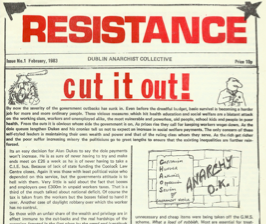 Resistance was produced in 1983 by the Dublin Anarchist Collective, which had come into existence the previous year. Despite the name, there was no formal connection with the Resistance! magazine published in Dublin in 1980. Circulation was about 500 copies. A couple of those involved, Sue Richardson and Steve Woods, had been part of the Dublin Anarchist Group (1978-1981). Other members were Eddie Conlon – who was one of the founding members of the Workers Solidarity Movement in 1984, Honorary Secretary of the Teachers’ Union of Ireland, and more recently a spokesperson for the United Left Alliance; Caroline Butler, Mary Flanagan and Marianne Heron. No.1 opens with a piece about the 1983 budget, much of which could be written today “..those with an unfair share of wealth and privilege are in effect immune to the cut-backs and the real hardship of the recession (created in the first place by the greed and ineptitude of capitalists and politicians)”, “..they are apt to use every trick in the book to con people into thinking they have no alternative but to take these measures”, “..the health cuts and the increasing shortage of hospital beds mark a regression to the last century”. 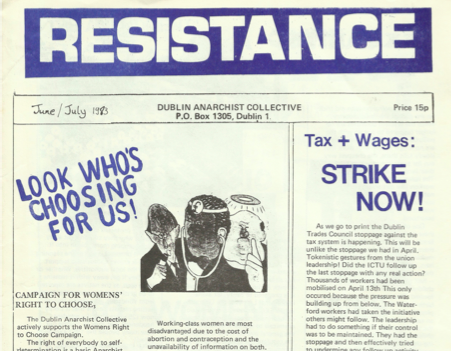 It also calls for a No vote in the anti-abortion referendum, looks at the then novel idea of community policing, the creation of unemployed action groups, and pays tribute to Doloures Lynch who was murdered in Dublin for standing up to pimps. 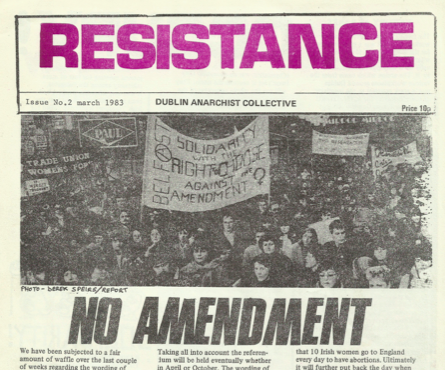 No.2 opens with opposition to the proposed Constitutional amendment to stop abortion ever being legalised, and urges readers to join the broad-based Anti Amendment Campaign. The occupation of the Ranks flour mill in Phibsboro is recounted, with the jailing and subsequent release of 14 workers. The unofficial strikes in support of them by the dockers, car workers at Nissan and Mazda on the Naas Road, Unidare in Finglas, Oldlums mills and others are contrasted with the inaction of the ITGWU head office. There is also an article by an ex-prisoner (Sue Richardson) criticising the jailed Ranks strikers for differentiating themselves from ordinary prisoners by saying they were not ‘criminals’. An article for International Women’s Day sees the oppression of women as a product of class society, “We have been deemed the servants of men, much as our men have been treated as the servants of the bosses”. A look at attempts to divide and conquer by implying that public sector workers are a burden on their private sector counterparts is given a page, and there are pieces about Emma Goldman, Polish feminism, an unemployed action group in Finglas, the trial of those who tried to fight their way to the British embassy after gardai stopped a hunger strike march, discrimination against women in dole payments, and the possible locating of cruise missiles in Northern Ireland. No.3 looks at the tax reform protest and the refusal of Waterford Glass workers to allow PAYE & PRSI to be taken from their wages. Also covered is the murder of gay man Declan Flynn in Fairview and Justice Gannon’s decision to impose no jail time on the convicted killers. Confidence in the willingness of the justice system to defend gays was further questioned, given that garda inquiry into another murder of a gay man, Charles Self, was used to compile dossiers on 1,500 gay people. The Peoples March for Decent Jobs is announced, this was a Cork to Dublin march financed by dozens of union branches, trades councils and unemployed groups. Rather than call for the ‘Right to Work’ their call was for ‘decent jobs’. This resulted from anarchists making the case that the jobless should not be thankful for scheme work or low paid jobs but should fight for socially useful work paid at trade union rates. 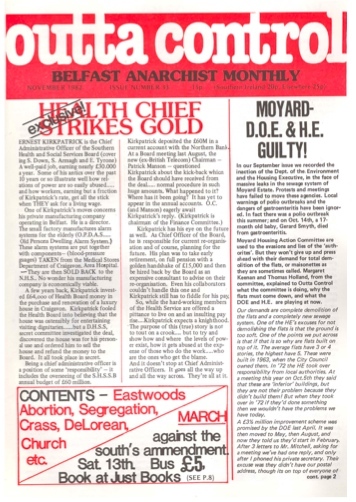 Other articles look at the proposal to build a major liquid gas storage facility in Clontarf, the continuing occupation of Ranks flour mill, the government ministers who drew pensions while working, a strike at Pizzaland, the creation of a co-operative creche by single parents in Ballymun, Nicky Kelly’s hunger strike, and a brief mention of the anarchist origin of May Day. There is also a snippet about a prison officer from Portlaoise who was shot and wounded as he left the National Boxing Stadium. Resistance says he had a long history of brutality towards prisoners. No.4 leads with support for abortion rights, this was in the run up to the constitutional referendum. The Waterford Glass workers’ tax protest spread to Dublin, with an unofficial shop stewards committee – which included a couple of anarchists – able to call a half-day strike in their own jobs. Among those out were Datsun, Tayto, Packard Electric, Tesco, Unidare, Rowntrees, and sections of Aer Lingus, Dublin Corporation and CIE.
‘Erin Go Expedience’ is a guest article by “a friend in the North who is now totally disillusioned with the Republican Movement, of which he used to be part”. The editors say the views expressed in it do “not entirely coincide with those of the Dublin Anarchist Collective” but don’t tell us what the differences are. Other articles include a rooftop protest in Mountjoy prison, a report on the Peoples March for Decent Jobs, a strike at KC bakery, and the export of toxic waste to countries with no effective controls is looked at in the context of the resulting illness and premature deaths.